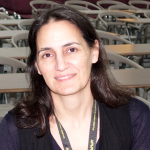 Paola Evangelidou currently holds the position of “Scientist” (since April of 2012) in the Department of Cytogenetics and Genomics of the Cyprus Institute of Neurology and Genetics (CING). She received her PhD from the University of Ioannina in 2012 with title “Molecular Karyotyping in prenatal Diagnosis”. Her employment at CING as a cytogeneticist started in 1995, and in 2002 she was appointed as Senior Laboratory Scientific Officer. She is also research associate faculty at the Cytogenetics and Genomics course of the Cyprus School of Molecular Medicine. Paola Evangelidou has been involved in the training and supervision of many employees and students in the course of her 24 years of experience in the field of Cytogenetics and Molecular Cytogenetics. She also has expertise and long-running experience in the field of microarray technology, as well as substantial knowledge in the field of Next Generation Sequencing (NGS). She participated in research grants as a team member and has several peer-reviewed publications, one book chapter and numerous abstracts in poster or oral form in international conferences. She is a member of the European Cytogenetics Association (ECA), board member of the Cyprus Society of Human Genetics (CSHG) and a certified inspector of the ISO15189, Medical Laboratories.